Fun With Frisian: GOEIE - "hello, good..."
Goeie is a basic "hello" in Frisian. It's pronounced GOO-ee ("oo" as in English "mood" and "ee" as in English "see"). If you are a techie, just think of GUI interfaces to remember this word. We can also say goeie moarn, or "good morning." For moarn... the o can sound something like a -w- and the -r- sound often drops entirely, so moarn sounds like it rhymes with "swan." In recordings, sometimes the schwa in goeie seems to get subsumed by the more audible "oh." GOO MWAWn. I work rotating shifts, so I like to say "good day" to greet people, because sometimes 9 P.M. is "morning" to me but not to anyone else. I'm not sure if they say "good day" to greet people in West Frisian. But it's a good excuse look at the word for "day." 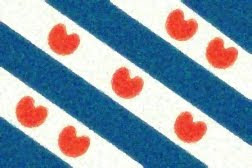 Dei is "day" is Frisian, but you pronounce it like the word "dye." Think of how the sun "dyes" the clouds with color at dawn. Then you'll always remember how to pronounce dei. Pronounce hy like "high." That's the pronoun "he." You can see the resemblance to its English cognate in writing, though it is said differently. Kohmt has that rounded "aw" sound like in "comma": KAWmt. So, HIGH KOHmt MWAW'n. Lokkige jierdei! (or Lokkiche jierdei!) Happy birthday! In lokkige, the o is a round "oh," but that i is pronounced with a schwa, like "uh" and an "e" on the end of a word often also sounds like a schwa. By itself, jier (meaning "year") is YEE-er. Strong "ee" sound like is "creek," with a schwa afterwards that may or may not be so audible. But apparently, just to confuse us, jierdei is pronounced with an "ih" as in English "bit" and drops the -r- and ends with a long "ee" as in "Eek! I've had it with this Frisian post!" So, LOHk-kuhg-uh YIHd-dee. On that note, that's enough for this dye... I mean, dei.